"We have been gobbling up these Vegan Blue Coconut Snowballs. Whenever my friends come over to visit I insist they try them and they have a unanimous LOVE for them. Serve this beautiful holiday dessert throughout the holidays and beyond. I love that they are vegan and I even snuck in more of the Blue Majik powder, so even the color is all natural! 1. In the bowl of a food processor combine the almond flour, coconut flake, Blue Majik Powder, coconut oil and vanilla extract. Pulse until the mixture starts to stick to the sides. Scoop the mixture out of the bowl and spread the mixture onto a cookie sheet and refrigerate for an hour. 2. Have a bowl with granulated sugar handy. Remove the mixture from the fridge, with clean hands, roll 1 - 1 1/2 inch balls. Immediately roll each coconut ball in the sugar after you roll it. The heat from your hands will help the sugar stick to the balls. 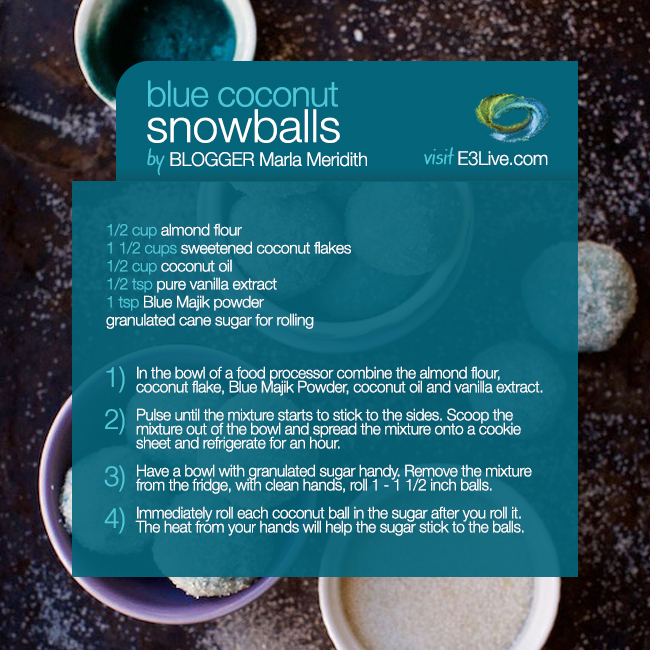 View this Vegan Blue Coconut Snowballs and other fantastic recipes on Marla's blog.